As I write this I've just realised that it is about a month until I return to work and my tummy has flipped, my heart is racing and I'm wondering where the past year has gone. By the time I return to work I will have had my full year of maternity leave, so I've been extremely lucky and my return to work isn't as simple this time as it was with Isabella. 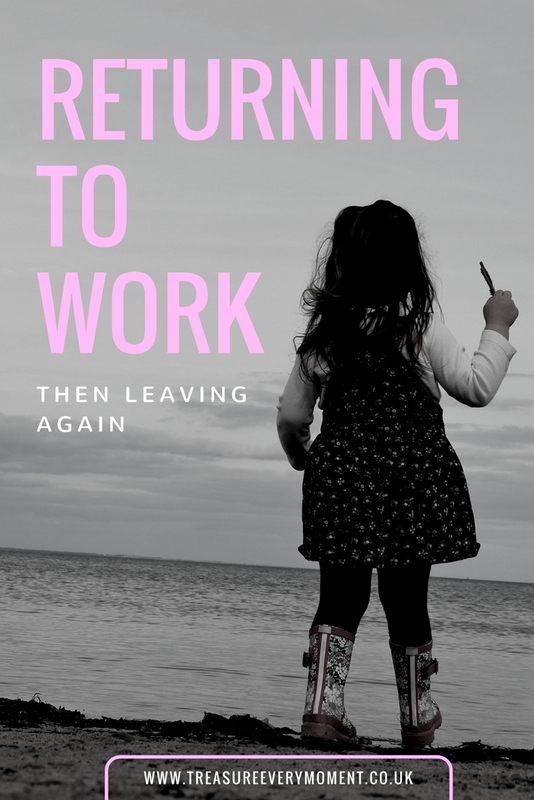 A while ago I wrote a blog post about whether I should return to work or not at the end of this maternity leave and after a lot of deliberation we have decided that I will return to work for a short amount of time and then leave. I love my job, but the nature of it takes up a lot of time and requires a large amount of work outside of 'working hours'. Despite going down to three days a week after having Isabella I still found getting the work/life/mummy balance very difficult. I was often having to work when I had hoped to be spending quality time with Isabella, so I can't imagine what it is going to be like going back now that I have two children. There simply isn't enough time in the day! This isn't a decision I've taken lightly and one that I'm completely happy about. I'd say about 70% of me is very excited about the prospect of being a stay at home mum, but the other 30% is scared and worried. The thought of being financially reliant on my husband makes me feel very vulnerable, so I hope to use the time to really focus on my blog/social media. I'm worried about filling our weeks with purposeful activities and how I'll mentally handle staying at home. Luckily over the past year I've built up a good group of mummy friends and between them someone is off every day of the week which is a bonus. If you're a parent then you'll know how hard it is. It's draining, pushes you to the edge and can send you into a downhill spiral very quickly, especially if a lack of sleep is thrown into the mix. For the past year I've not really had a break, no days away from my children or even an afternoon. Since having Isabella I've only spent two nights away from her and one was to have Poppy! You could say I'm used to having no 'me time', but the longer that goes on will it get to a point when I'll need some? Only time will tell I guess. I will only be going back to work for around two months, which is the time needed to not have to pay back the extra maternity pay I received. I know it's only two months, but the idea of establishing a new family routine scares me because we've never done the work routine with two children before. I can't even remember what my work day routine was prior to Poppy, which leads me nicely onto my other worry. Am I able to use my brain still? I know that sounds silly, but it feels like it's gone to mush over the past three years. The constant crying or moaning or hassling or chatting, paired with little sleep and anxiety issues makes concentrating on anything properly very difficult. It feels like I can't remember anything about my job and the nature of it means I probably don't anymore. The fast pace and the fact that things are always changing means that I'll be so behind. By the time I get my head around it all I'll be saying my goodbyes and starting life as a full time blogger/stay at home mum. But it's not all worry; there is a lot to look forward to as well. I plan to use the time to really focus on my blog and social media, which will mean I have a way to still earn a small amount of money. I would also absolutely love to work it out that I get some one-on-one time with Isabella because it recently dawned on me that it will be her last year before going to school. It would be so special to be able to do 'big girl' things with her, like go to the cinema, theatre or even just for a hot chocolate/babyccino date. The things we can't do as easily with Poppy and really concentrate on making memories just the two of us again. Something else I really need to work on is my driving related anxiety and hopefully by technically being available everyday of the week for therapy I'll be able to conquer it and open up my world again. To be able to drive anywhere I want to would be the dream, but more realistically just to drive on an A road would be amazing. So that's the plan going forward - returning to work for a very short amount of time and then living life as a stay at home mum/blogger. It's scary, yet exciting and I feel so incredibly lucky to be able to do this. It's such precious time with my babies and I'm determined to make the most of it. Even if it completely terrifies at the moment; I guess it's just the unknown. If you've been on maternity leave did you find it hard to know what to do when it came to an end? I can understand this - I didn’t go back after my second with the plan to stay at home until she started school but by the time she was 2 I was freelancing as I just need something else to fire off different parts of my brain. I love the flexibility of working from home though. I totally understand this. I didn't end up going back after my first because the travel and childcare costs would have eaten most of my wages and then I would have been out of the house for 12 hours a day. It just wouldn't have been practical. Being a stay at home Mum is great but can be tough too. My biggest problem is keeping my brain active... I get bored easily so blogging helps take the edge off that. I am very much for women deciding to do what works best for them-so your decision to be a stay at home mum soon is perfect for you and your family. Good on you for weighing up both options and not bending to what society thinks you should, making your own decision. The first time I was on maternity leave, I applied for voluntary redundancy and moved abroad. The second time, I was on a fixed term contract which ran out. So I've not really been in the position of returning. Have been finding it a struggle now finding new work that fits around childcare. I'm only four months in to my maternity leave and already it's going quickly and I can't imagine that day when I go back to my job. I have the same anxiety...will I know what to do? It will be a new routine but once you have established it, you will be fine. Just remember to make sure to do things for yourself and see friends as often as possible so that you are not isolated. It is a good decision for your family. I have known some women have decided to something very similar to you. They have mostly said that their family is more important and so if the upbringing of their children. You have truly agonised over this, but you have made the best decision for your family. I have been a stay at home mum and planned to go back to work at the end of last year...then I fell pregnant again! Planning structured days definitely helps, but that niggle of being financially dependent on someone else never goes away. You've had such a tough time with yourself fighting over what you want to do, but at the end of the day, you have to go with your gut and what you feel is best for you and your family! Good luck with your return, even if it's a short return. I haven't returned to work outside the home since I had my son 13years ago! I would be so scared if I had to go back to work somewhere! Best of luck on your return to work. I went back after a year's maternity leave and went back full-time, a decision I later regretted and then fought for reduced hours. I then gave up a job I loved as we prepared to move to Portugal. I miss adult conversation other than my husbands and despite filling my day with my blog I'd go back to that job on a part-time basis in a heartbeat.